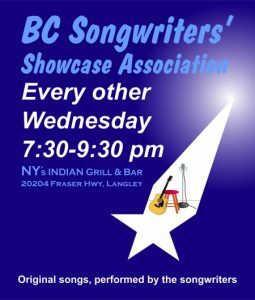 The Songwriter Showcase last night featured three different performers… all talented performers and songwriters. The Evening started off with Angela Harris performing a mix of songs from her award-winning albums, as well as some new material. Angela then introduced us to (first) Savannah Quinn and (later) Amanda Thate – two singer/songwriters from Abbotsford. Each got up and performed a few of their songs. The Showcase was closed out with Angela performing a few more of her songs, before Bruce opened the stage for the Open Mic section of the evening.